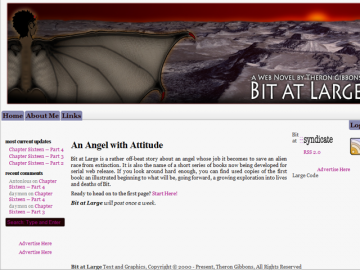 Bit at Large is a rather off-beat story about an angel whose job it becomes to save an alien race from extinction. It is also the name of a short series of books now being developed for serial web release. If you look around hard enough, you can find used copies of the first book about: an illustrated beginning to what will be, going forward, a growing exploration into lives and deaths of Bit. Bit at large has not been tagged yet. Help others find Bit at large by tagging it! Bit at large has not been reviewed yet. Bit at large has not been recommended yet.